During the Iron Age, roads were built across bogs using timber. These roads were known as tóchar and the name still survives in some place names. As these ancient roads fell into disuse, they disappeared into the bog and thus the original timbers were preserved to modern times. For many years the primary communication routes for long distance were by sea and inland waterways as well as by road. Now with continuous investment in roads and in particular the long distance primary routes, sea transport is kept as short as possible because land transport is far quicker and more comfortable. Investment in the National Primary routes and National Secondary routes is channelled through the National Roads Authority, with the local County Council or Corporation still playing a major role in design, land purchase and construction. 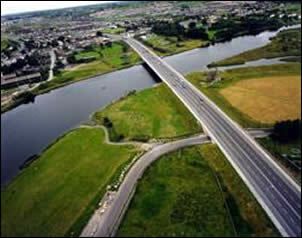 This project, considered as an important contribution to the infrastructure of Connacht and the North West, was carried out between 1995 and 1998. This new road, which is partly in Counties Roscommon and Sligo and runs west of Lough Key and Lough Arrow, replaces the old N4, which involved a torturous ascent and descent over the Curlew Mountains. Roscommon County Council were responsible for project management of the scheme, which was undertaken in part by direct labour and in part by contract. An Environmental Impact Statement was carried out for the project. This was not required by legislation but was undertaken because of the sensitivity of the landscape through which the road traversed. Measures undertaken to reduce the visual impact of the new road included the soiling of rock embankments, which otherwise would have been evident from 5 km away. The bitumen pavements, which are used on almost all Irish roads, consist of a mixture of aggregate, filler, bitumen and additives. There has been considerable research in additives over the years in order to produce a variety of materials to match different requirements. Chemoran, based in Oranmore and a member of the Cold Chon Group of companies, has been producing specialised chemical products for the roads industry since the late 1940's. It now exports to some 56 countries in five continents. The materials developed and manufactured at the Oranmore plant include adhesive agents to improve the adhesion between bitumen and stone and various additives used in the manufacture of many types of cationic bituminous road emulsions. A research laboratory has been established in conjunction with NUI, Galway. It is an example of how new products are developed through collaboration between the private sector and third level institutions and involving scientists and engineers.l institutions and involving scientists and engineers. In the year 2000, design teams are in place for a number of significant roads projects in the West of Ireland and the National Development Plan, 1999 includes for major expenditure on roads over the first decade of the new millennium. Implementation of this roads programme will improve connectivity between the West and the rest of country and presents opportunities for engineers in the design and construction stages.